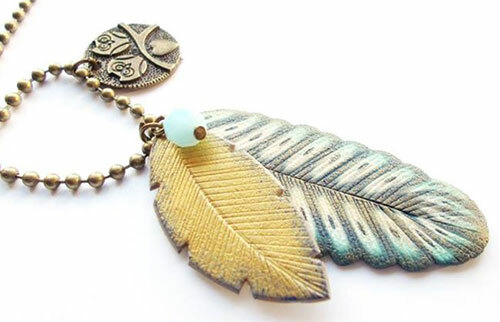 France’s Isa Maria Noella Castellano combines a couple of flat, subtly textured polymer feathers with a bead and a metal charm, suspends them on a ball chain and comes up with a very trendy pendant. The translation software calls them Giraffe Feathers…does that sound right? She used this soothing photo as her header on Facebook. If you missed last week’s online I love tools, you can read the recap, follow the tool links and get in on the door prizes. (Alison’s new Craftcast site was loading and the raffle had to be delayed until all the pixels were in place.) A $10 raffle ticket helps the Samunnat project and gets you in the pool for some great prizes. Winners announced on October 27. Speaking of prizes, the cutoff for Iris Mishly’s Flower Academy drawing is Thursday night. Make a comment on Monday’s post to enter. Good luck! Thank you very much for my work ! Love the design and soft colors! Now, all I can think about are giraffes with feathers ?(????)? Your work is enviable, Isa! Yes you can PiperPixie lol !!!! thank you very much, it was a private joke….I lost to a FB game…. Wow I love these. What a beautiful colour palette. Thanks so much for sharing these ones. Each piece is a work of art!